Last weekend, after Pranksters in Pumps, I went to my friend Shahram's party. 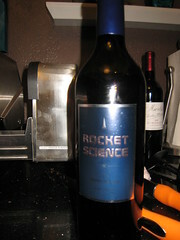 Okay, this is the first time I've heard of a wine called Rocket Science. I just thought that's weird. I would think you would be interested with that. I never tried it. But the host of the party did. He said it's good red wine. Are you more of a beer drinker? Me, too. I don't keep much alcohol either. I have some but they're usually just gifts. 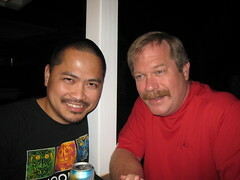 My partner just drinks Bud light so I sometimes do, too. However, I like Shiner Bock for beer. Some French wines (not an expert, but I just like it when they say it's French haha), and sometimes a whiskey sour. Coconut Rum + Cranberry? Is there a specific name for that? The next time you see Shahram, please tell him I said hello :) He and I used to chat all the time but kinda lost touch. Being married and all, I don't know if he still chats.